By the time Pat Thomas was in high school, he already knew what he wanted to be. He wanted to sing highlife. This wasn’t surprising, as he came from a musical family. Pat Thomas’ father taught music theory, his mother was a bandleader and his uncle was legendary Ghanian guitarist King Onyina. Given his background, it wasn’t surprising Pat Thomas wanted to make a career out of music. Music was in Pat Thomas’ blood. He grew up surrounded by music. That had been the case since Pat was born in Agona, in the Ashanti region of Ghana in 1951. Growing up, he listened to all types of music. However, it was highlife that struck a nerve with Pat. By the time he was in high school, Pat Thomas dreamt of singing highlife. However, he was too young. This wasn’t going to stop Pat Thomas embarking upon a musical career. So while he was at high school, Pat Thomas started singing covers of songs by Stevie Wonder, Nat King Cole, Miriam Makeba and Jimmy Cliff. While this wasn’t ideal, it was a start. The next chapter in Pat Thomas’ career began in 1966. Pat was only sixteen, but something of a musical prodigy. This was in part, thanks to his uncle. He took Pat under his wing. Soon, he was able to write music, and play guitar and drums. However, it was as a singer that Pat Thomas excelled. Already he was a familiar face in local clubs, and was perceived as one of the rising stars of the local music scene. That’s why he was hired as an arranger by one of the biggest names in Ghanian music, Ebo Taylor. Over the next few years, Pat Thomas and Ebo Taylor played together in various bands. This included the Stargazer’s Dance Band and the Broadway Dance Band. Pat was the arranger and vocalist, while Ebo played the guitar. They were a formidable duo. However, despite their close friendship, Pat Thomas made the decision to journey to Britain. That’s where Pat Thomas and Ebo Taylor renewed their musical partnership in 1971. That’s when Pat joined the Blue Monks. Again, Pat was the vocalist and Ebo the guitarist. They were resident at the Tip Toe Nite Club, where the Blue Monks would make their mark on Ghanian musical history. They’re now remembered as one of most important and influential Ghanian bands of the early seventies. However, just like before, Pat and Ebo went their separate ways. This time, Pat Thomas moved to the Ivory Coast. After a while, Pat decided to return home, and once more, reunited with Ebo Taylor. In 1974, they joined Sweet Beans, a group sponsored by the Ghana Cocoa Board. Then five years later, in 1978, Pat and Ebo embarked on a collaboration with another legend of African music, Fela Kuti’s former drummer, Tony Allen. At the time, Pat Thomas, Ebo Taylor and Tony Allen were at the peak of their powers. They were like an African supergroup. The collaboration came about when Tony Allen was rerecording the soundtrack to Black President in Accra. When Tony had some downtime, he headed to Kumsai to record with Pat and Ebo. Sadly, the sessions never saw the light of day, after they were destroyed in a fire. However, four decades later, and Pat Thomas would collaborate with his old friends. Recently, Pat Thomas recorded an album with the Kwashibu Area Band, in Accra. This all-star band featured Pat Thomas’ old friends Ebo Taylor and Tony Allen. They feature on Pat Thomas and Kwashibu Area Band’s eponymous debut album. It was recently released by Strut Records and is the latest chapter in Pat Thomas near fifty year career. Pat released his debut album in 1978. By then, Pat Thomas was no stranger to a recording studio. He had released an album with The Sweet Beans False Lover in 1974. It was released on Gapophone Records. That was their one and only album. However, for Pat Thomas, this was just the start of his recording career. Two years later, in 1976, Pat Thomas released his live album Wednesday At Tip Toe. This was where recorded where The Blue Monks once enjoyed a residency. In 1976, Pat Thomas was taking centre-stage. That night was recorded for posterity, and released on Gapophone Records. The same year, Pat released his first collaboration with Marijata. Pat Thomas Introduces Marijata was released in 1977, on Gapophone Records. This was the first of two albums Pat released with Marijata. The followup was Pat Thomas and Marijata, which was released in 1978. After that, Pat decided to concentrate on his solo career. This was the same year that the fated Thomas, Taylor, Allen sessions took place. However, In Action Volume 1, which was released by Gapophone Records, fared better. It was actually released, but by then, Ghana was a troubled country. Ghana was in the throes of a coup d’état lead by Flight Lieutenant Jerry Rawlings. Many Ghanians fearing their safety, fled the country. Those that remained, their lives were in danger. Nothing was sacred. To make matters worse the military junta set about destroying the Ghanian music industry. They went as far as destroying the master tapes in Gapophone Records’ vaults. Musicians like Pat Thomas looked on helplessly. However, they weren’t going to be silenced. So in 1979, Pat Thomas released In Action Volume 2. Just like its predecessor, it was released by Gapophone Records, which essentially, was the only show in town. However, after that, Pat Thomas left Ghana, and headed for London. In 1980, Pat Thomas released Pat Thomas 1980, which was the most eclectic album of his career. Elements of disco, reggae, pop, funk and soul could be heard on Pat Thomas 1980. It was very different to Pat’s previous albums and marked the start of a new chapter in his career. Two years later, Ebo Taylor, Pat Thomas and Uhuru Yenzu collaborated on Hitsville Re-Visited. Accompanied by an all-star band, this Ghanian supergroup won friends and influenced people when the album was released in 1982. The following year, Pat released another solo album. 1984 saw the release of Pat Thomas and Ebo Taylor released another collaboration. It was released on Dannytone Records and featured two of Ghanian music’s most influential musicians. They had been working together for eighteen years. However, the last few years hadn’t been easy. Both men were exiles. Despite this, Pat was about to enter the most productive period of his career. Now living in Canada, this productive period continued. In 1987, Pat released Pat Thomas and Friends and his solo album Santrofi. This productive period finished in 1988, when Pat released Me Do Wiase in 1991. The next time Pat Thomas released an album, he would be back home, in Ghana. Pat Thomas returned to Ghana in 1997. Not long after this, Pat signed to the Megastar Company and released his Sika Nantie album. Soon, Pat Thomas was back where he belonged, at the top of the Ghanaian music scene. His comeback was complete in 2008, when he starred at the Made In Germany burger highlife festival. However, since then, Pat Thomas has stayed and played in Ghana. While his old friend Ebo Taylor has travelled overseas, and had reinvented himself, becoming an international star, Pat Thomas was happy to remain in Ghana. He had spent over twenty years living overseas. Now he was home. Although he wasn’t playing live as much as he once had, he was still in demand for gala dinners and corporate functions. Nor had Pat recorded an album for a long time. However, in 2013, he got the chance to return to the studio. The all-star band that convened in the Accra studio, included some of the biggest names in Ghanian music. This includes percussionist Eric Owusu, bassist Emmanuel Ofori, saxophonist Abaranel-Wolff. He co-produced the album with multi-instrumentalist Kwame Yeboh. They’re just three members of this multi-talented band. Add to the equation Tony Allen play drums on three tracks, Ebo Taylor’s guitar licks and Pat Thomas’ vocals. The result is the long-awaited and much anticipated eponymous debut album from Pat Thomas and Kwashibu Area Band, which I’ll tell you about. Opening Pat Thomas and Kwashibu Area Band is Mewo Akoma. This is a song Pat Thomas wrote some years ago. It’s a four part highlife medley, which Pat sings in Fanti. The lyrics examine life and love. Big bold stabs of horns join gyrating drums, a picked bass and the pumping organ. Together, they create a joyous, celebratory sound. Atop the arrangement, sits Pat’s heartfelt vocal. When Pat’s vocal drops out, guitars chime, and dramatic stabs of horns are unleashed. They’re joined by a myriad of percussion, bouncing drums and subtle stabs of an organ. Then when dramatic surges of horns signal the return of Pat’s vocals, he’s accompanied by harmonies. They’re the perfect accompaniment for Pat’s soulful vocal as he embarks upon his comeback. Ebo Taylor and Pat Thomas penned Gyae Su. A crystalline guitar skips across the arrangement. It’s accompanied by a pulsating bass that’s reminiscent of the kwa guitar bands. They’re joined by bursts of joyous horns and pounding hypnotic drums. Pat’s vocal is soothing, as he sings: “don’t cry, life has its ups and downs.” Accompanying him are harmonies and swathes of chiming guitars. Meanwhile the rhythm section create a pulsating groove and the horns add a delicious feel good sound. Although Odoo Be Ba has highlife written all over it, various genres of African music play their part in the overall sound. That’s the case from the moment the rhythm section, percussion and crystalline guitars combine. As Afro-beat drums provide the heartbeat to this pulsating groove, bursts of organ and shrill stabs of horns are added. They’re arranged by Ebo Taylor. Pat’s vocal is tender. Especially as he sings: “my love will come…I’m waiting for my love.” Equally tender harmonies compliment Pat’s heartfelt, hopeful vocal, as a quite beautiful slice of modern highlife unfolds. Oye Asem sees Pat Thomas and Kwashibu Area Band head in the direction of Afro-Highlife. That’s down to Ebo Taylor’s horn charts. Add to this Kumsai guitar playing and of course, a masterclass from drummer Tony Allen. This seems to inspire, who accompanied by harmonies, delivers a tender, thoughtful vocal. Then when his vocal drops out, the band take centre-stage. Bursts of horns soar above the arrangement. Meanwhile, the bass and organ weave across the arrangement. Later, stabs of horns and bursts of organ add to the drama, as everything from Afro-Highlife, jazz, funk and soul can be heard on another of Pat Thomas and Kwashibu Area Band’s highlights. Brebrebre comes with a message from Pat, “don’t rely on your worldly possessions.” He knows what he’s talking about. He once fled Ghana, during the 1978 coup d’état. Against a pumping, mesmeric arrangement, Pat delivers an impassioned vocal. Stabs of horns, chiming guitars and washes of Hammond organ play their part in the arrangement. It’s anchored by the rhythm section. Along with the rest of the Kwashibu Area Band they provide the perfect backdrop for Pat Thomas. He’s accompanied every step of the way by harmonies, as he combines highlife and social comment. Fittingly, Amaehu is a collaboration between Pat Thomas, Ebo Taylor and Tony Allen. The rhythm section, including Tony Allen’s drums combine with the unmistakable sound of a Hammond organ. They’re soon joined by the horns, arranged by Ebo Taylor. Clearly, his inspiration for the horns has been Afro-beat and highlife. However, playing a leading role are the keyboards. They play a vital part in the sound and success of Amaehu. Along with the rest of the Kwashibu Area Band, they set the scene for Pat Thomas. His vocal is impassioned, heartfelt and soulful. Answering his call are backing vocalists. They compliment Pat’s vocal perfectly, and like the rest of the Band, ensure the album ends on a high. Forty-nine years after his career began, Pat Thomas is the highlife’s comeback King. It’s a while since he last released an album. However, at last Pat Thomas is back, and back doing what he does best…making music. 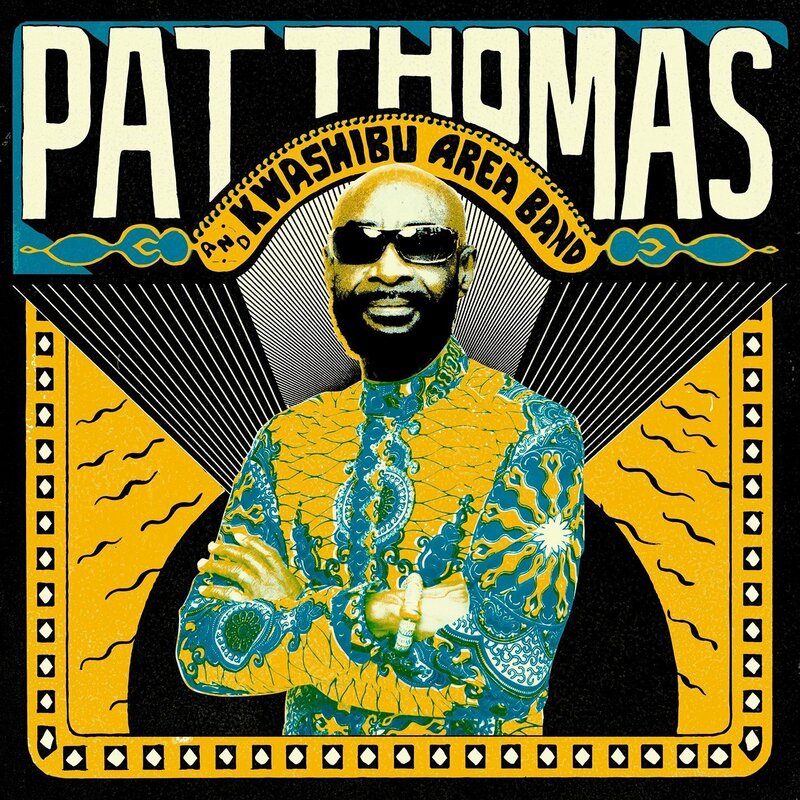 The result is Pat Thomas and Kwashibu Area Band, which was recorded in January 2014. Over a year later, and Pat Thomas and Kwashibu Area Band was recently released by Strut. It’s a return to form from Pat Thomas and his all-star band. That’s the perfect description of the Kwashibu Area Band. Not only does Tony Allen play on three tracks, but Ebo Taylor arranged the horns. That’s not forgetting percussionist Eric Owusu, bassist Emmanuel Ofori, saxophonist Abaranel-Wolff and multi-instrumentalist Kwame Yeboh. They’re just a few of the musicians who played a part in the sound and success of Pat Thomas’ long-awaited and much anticipated comeback album. It’s an album that could’ve been released back in 1978. Back then, Pat Thomas, Ebo Taylor and Tony Allen were at the peak of their powers. They were like an African supergroup. The collaboration came about when Tony Allen was rerecording the soundtrack to Black President in Accra. When Tony had some downtime, he headed to Kumsai to record with Pat and Ebo. Sadly, the sessions never saw the light of day, after they were destroyed in a fire. However, four decades later, and Pat Thomas got the opportunity to collaborate with his old friends. They might be thirty-seven years older, but they’ve not lost their touch. On Pat Thomas and Kwashibu Area Band, Pat Thomas and Ebo Taylor continue what they set out to do nearly fifty years ago. That’s reinvent highlife. They’ve been doing that throughout their long and illustrious careers. They continue that on Pat Thomas and Kwashibu Area Band, which marks the welcome return of a legend of highlife veteran and comeback King, Pat Thomas. ← RACHEL SERMANNI-TIED TO THE MOON.